1. TxtaJob.ie is a first mobile recruitment application in Ireland. The BETA was released a few months ago. How is Ireland embracing it? Is Ireland ready for Mobile Recruitment? Job seekers and employers alike seem to be embracing the idea without question. This is evident in the 1800 job postings to date, with about 1200 active at the moment. Hundreds of job seekers have signed up before we have even started advertising. We are certain that Ireland is ready for mobile recruitment, especially given where mobile technology is. With WiFi access and large screens the new norm for mobile phones, we are perched to be the first to grab the recruitment market via a mobile platform. 2. The benefits from Employers are obvious – your service is free! What is the take-up like and what are the general trends? In short it has been fantastic! It has exceeded our expectations by a mile really. What is even more important is that the subscription rate is actually accelerating. We get the same amount of job hunters subscribed in a day now, that it took us a week to get when we started. 3. Jobseekers get the unique service from txtAjob.ie. You simply subscribe and get your offers on your mobile. What was the initial feedback during the BETA period? We took on board literally tons of constructive feedback and suggestions. The category listing is perhaps the best example – where the job hunters and the employers actually defined it for us in those first few months. The service we provide now is already miles better that what we could achieve on the first day when we launched. 4. How does the competition react? In fact are the traditional Irish jobs sites a competition at all? Is there any competition? The competition has yet to say anything about us, that we know of! Although we are providing a different kind of way to search for employment and our service is free to employers, our competition is still the likes of IrishJobs.ie, Jobs.ie, and your regular job boards such as Gumtree.ie. We are however providing something unique to the Job Seeker, while providing a more organised, cost effective medium for the employers. We are job seeking on the go, getting the information to the candidates for the employer as soon as the job is available. 5. How do you see the economy in Ireland today? Are there sectors clearly out or still deeply affected by the recession? We feel positive about the economy and like to believe things are on the upswing. We have noticed a bit of a downward trend of using recruitment agencies, while companies are searching direct. In saying that, the recruitment agencies we have contacted seem as busy as ever. We have noticed lack of jobs in the Banking, Tourism & Travel and aviation industries. There is plenty of work in Web development & design, driving, cleaning, and general trades. Then again maybe its just the companies and recruiters we have yet to speak to, only time will tell! 6. What sectors of the industry do you serve the best so far? What sector embraced the new technology and the business model fastest? What sectors are lagging behind? It is hard to say, it is still early days. We haven’t seen any specific sector pick it up faster than another. All employers are keen to get free advertising of their job postings for free via the website. While professional work is being put up through the website, general work (a days painting or plumbing) is being posted mainly via our quick texting system by texting the word Ad + Job description (160 characters) to 51000 (standard text rates). 7. What’s next for txtAjob.ie? The launch of our own mobile phone application with 92% mobile phone compatibility across Ireland is what certainly excites us the most. While we are not the market leader in job advertisements, we are the first and only business to provide the service on a mobile platform. We believe mobile phones and all of their technology is the way of the future, and we are successfully leading the recruitment industry in Ireland that way. We want to make sure that if there is a job in Ireland, we send it to the interested job seekers mobiles instantly. Our mobile application will make it easier than ever to receive and apply for relevant jobs instantly without having to use a computer. You will even be able to type a quick cover letter and send your CV which is uploaded to the system when you register. Personal branding is certainly the next step for us, look out for our radio ads on FM104 and Newstalk. Since the economy bottomed out and took scores of Irish jobs with it, purveyors of job boards have seen corporate customers curb or cut contracts at the same time they’ve dealt with an influx of résumé postings from the newly unemployed. More companies also are adding job postings and career centers to their Web sites, or are using social networks such as Twitter, Facebook and LinkedIn for recruiting, which raises the possibility that they won’t go back to previous levels of job board spending once the recession ends. The result: falling revenue and earnings, as evidenced by publicly traded job boards such as industry leader Monster Worldwide, which in the first half of 2009 lost $11.7 million on revenue of $477.4 million, a 34 percent drop from the same period last year. Peter Zollman, executive editor of Classified Intelligence, a consulting group that tracks the classified advertising and job board industries, says that while the job board industry has struggled in 2009, some privately held firms may be better positioned to weather the recession. One such firm is EmployIreland.ie. EmployIreland.ie is the only job site in Ireland that hasn’t been letting go it’s staff during the recession. Irish Jobs lost their largest client – CPL. Jobs.ie is selling traffic left right and center. They even implemented Pop Under windows, and that’s surelly the worst marketing practice. RecruitIReland even went free for a the best part of the year to get jobs on their site. Loadza made all kind of experiments like Online Jobs Fair that did not stop clients leaving. The traffic job boards in Ireland are attracting fell drastically, as well as their revenues in 2009. Most of the jobs sites are actually using Google AdWords PPC to drive traffic, since there is simply not enough ‘organic’ – natural traffic from the search engines. The fact that the revenues of the Irish job boards will not bounce back up is something all of them are trying to hide. Or they simply live in denial. 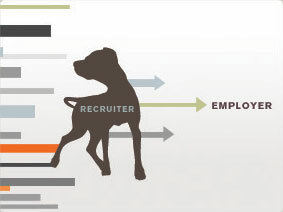 Social networks is where the recruitment is turning to and massive job boards will slowly be losing their revenues. Going forward it will not be so rapid as it was in the 2009, but there is less and less advertising revenue available for jobs advertising in the years to come. Even new jobs sites are not popping up as quick as they did up until just a few months ago. EmployIreland.ie is in the unique position to thrive in the current market. It is agile enough to change with the times. EmployIreland.ie is in its core a technology company Portal.ie. The experiments with the recruitment social networks lead to a number of BETA releases like JobsMarket.ie and JobsBoard.ie, and a few international ones. By running the only Irish real time job posting system eRecruit.ie, the company is in the unique position to…. I am kind of out of inspiration any more. Just remembered the title of the Recruitment Conference yesterday: The Future of Recruitment … Job boards are less and less part of that future. EmployIreland.ie will lead the way by innovation, and embracing the new ways of doing business in recruitment industry!